Wednesday January 25 1911 I got my work done and a nice dinner. Hattie & Ella Wilcox were out for the day. We had such a good visit. I washed my dishes after they went home. 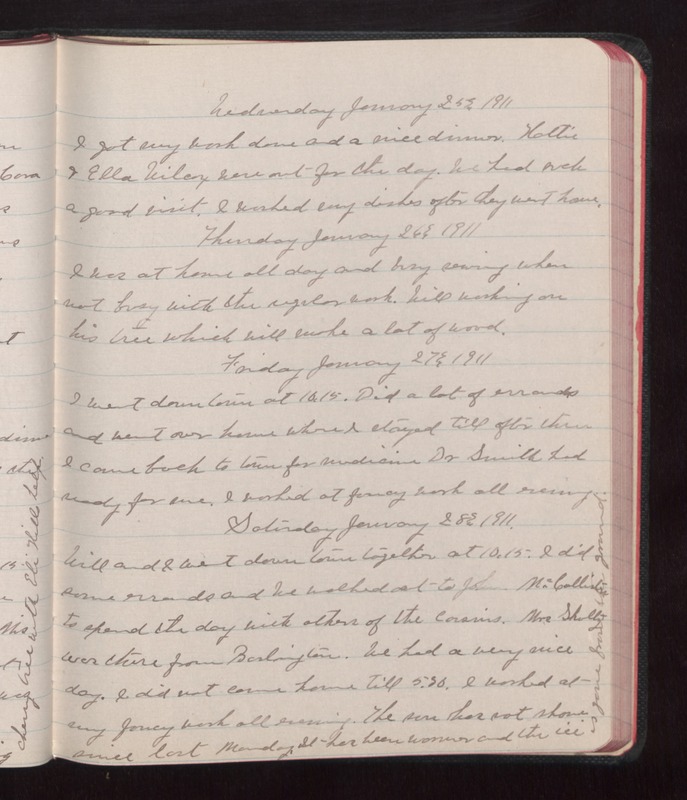 Thursday January 26 1911 I was at home all day and busy sewing when not busy with the regular work. Will working on his tree which will make a lot of wood. Friday January 27 1911 I went down town at 10.15. Did a lot of errands and went over home where I stayed till after three I came back to town for medicine Dr Smith had ready for me. I worked at fancy work all evening. Saturday january 28 1911 Will and i went down town together at 10.15. I did some errands and we walked out to John McCollisters to spend the day with others of the cousins. Mrs. Shelly was there from Burlington. We had a very nice day. I did not come home till 5.30. I worked at my fancy work all evening. The sun has not shown since last Monday. It has been warmer and the ice is gone from the ground.